5"W resin and stone mix, holds a 2.5" x 3" photo. 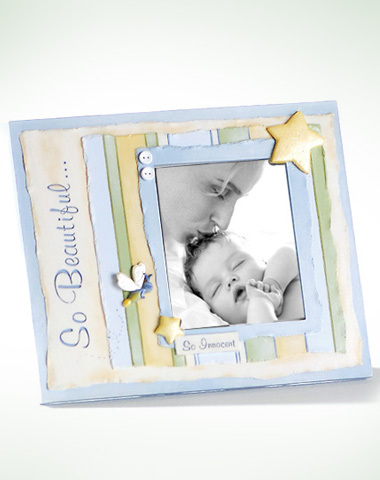 This beautifully sculpted frame has a charming baby-boy-scrapbook appeal. Accented with 3D stars, stripes, buttons and a firefly that symbolize the wonderment of your baby boy, so sweet ... so innocent. This hand-painted frame is adorable To display your baby's tender moments.